Whilst we often work hard to get the perfect shot, some just seem to seek us. This scene was waiting for me earlier this afternoon. I walked into our living room, looked out to the balcony and there it was! Perfect angle from the sunlight, sitting at the top of the balcony fence and perfectly matching the colours of the distant background. I raced downstairs to grab my camera and approached it slowly to get this result. Nice shot! 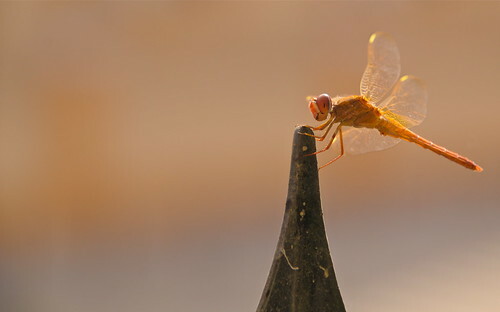 I love Dragonfly’s. never seen an orange one! ve seen green, brown, red ones. have to look out! It actually flew off and landed back again… What more could I ask for? That is a beautiful and well timed picture!!! Well done! Oh! The way the sun is glinting off the wings! Oh! Oh! All your photographs are really nice with a lot of character in them.